Welcome to Week 34 of Year 5 here at PPF! Random.org this week chose #35 - Jo. This week Jo was painting pumpkins! (How appropriate and timely random.org is some weeks!) These are the two for this year but she has more to show us from previous years in her post - please check it out! Have you ever painted pumpkins? Have a spooky and creative Hallowe'en and week! Welcome to Week 33, Year 5 of Paint Party Friday! This week, the random.org number generator chose #59: Lisa Isabella Russo. 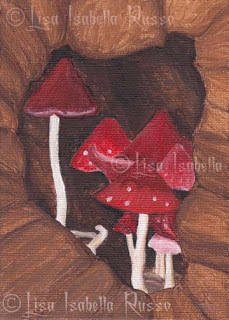 Last week Lisa shared a whimsical mushroom village. Please be sure to stop by her blog to see what other magic she's making with paint! Welcome to Week 32, Year 5 of Paint Party Friday! This week, the random.org number generator chose #18: Morag. 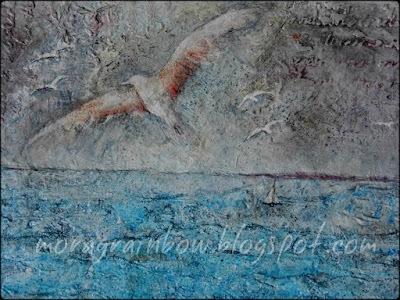 Not only did Morag share a spectacular canvas with us last week, she also shared her the inspiration behind it (as well as progress photos!)... It is a wonderful blog post, so please be sure to stop by! We hope your creativity soars this week! Welcome to Week 31 of Year 5 at Paint Party Friday! Happy Thanksgiving Weekend to all our Canadian friends and PPFers!! This week, random.org chose #54 - Marji. 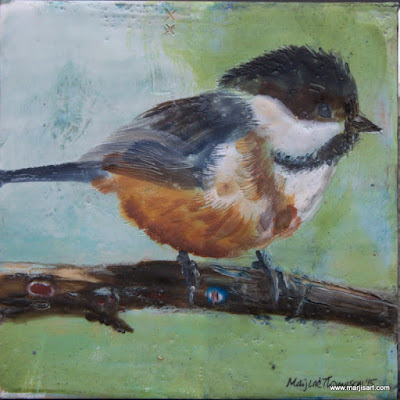 With fall arriving in the Northern hemisphere, the chickadees seem to be back and Marji (like others of us) is thoroughly enjoying watching them and their energetic antics. This week she has captured their cuteness and charm in this lovely encaustic painting. Welcome to Week 30, Year 5 at PPF! This week our random number generator chose #22 - Jill Holmes. Jill has been working on the "29 Faces challenge by Ayala Art" and this is her 18th face so far - a fun self portrait in mixed media.